4.5'' PureMotion HD+ IPS panel with pixel dimensions of 768x1280 (332 ppi), Corning's Gorilla Glass protection, 60 Hz refresh rate, Polarization filter, 600 nits of luminance. Dual-core 1.5 GHz Snapdragon S4 chipset, 1 GB of RAM. 8.7 mp auto-focus PureView camera with dual LED flash, Carl Zeiss Tessar optics, 1080p video recording. NFC, Bluetooth 3.1, Wi-Fi with hotspot support, GPS with offline navigation. 32 GB internal storage, 7 GB in SkyDrive (cloud storage). 2000 mAh battery, 17 hours of talk time for 2G (10 hours for 3G), 67 hours of music playback, 6 hours of video playback. 3.5 mm jack with Dolby sound support, Micro-USB port. Micro-SIM, Quad-band GSM (850, 900, 1800, 1900 MHz), Quad-band 3G (850, 900, 1900, 2100 MHz), Penta-band 4G LTE (800, 900, 1800, 2100, 2600 MHz). Supported Audio: ASF, WAV, MP4, AAC, AMR, MP3, M4A, WMA, 3GP, 3G2, AAC LC, AAC+, eAAC+. Supported Video: MP4, WMV, 3GP, M4V, M4A, VC-1, H.264/AVC, H.263, MPEG-4. Nokia has also confirmed the availability of an induction charging accessory (a charging pad) for the Lumia 920. You simply place the phone onto the pad to charge its battery, thus eliminating the need for a charging port. This allows you to use the same power supply across multiple devices that support this feature. The handset will come preloaded with Nokia Maps, Nokia Drive, and City Lens (an augmented reality app). 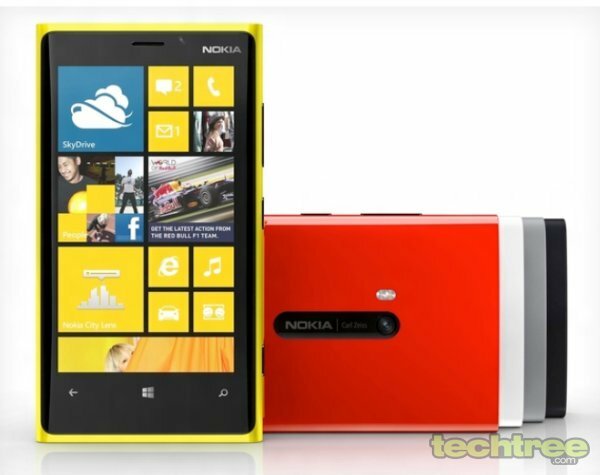 Users will get to choose from yellow, red, white, grey, and black variants of the smartphone. However, there's no info yet regarding its launch date and pricing. You can view a few high-quality images of the phone and its charging accessories in the gallery below.